I shot the steel plates match today at ARPC. The weather was cold, but not miserable. It warmed up a tad toward the end. There were 5 stages, pretty standard stuff. But there's something to learn at every match. Like don't walk up to the line without checking that your magazines are full. Sheez. I ran out after 4 shots in the first string on one stage. Dumb. 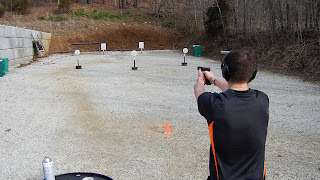 Also, I'm pretty quick and accurate with short courses of fire (15 yards and in), but I need to remember to slow down when the plates are 15-35 yards. Slowing down is hard for me these days. And did I say that I hate the Outer Limit's stage. I hate it! That's the one in the picture. We had two new shooters in our squad. New to steel plates and new to competition shooting, I'm pretty sure. They needed some coaching. And everyone helped out just fine. One of the shooters was missing a whole lot of shots. That can be really frustrating with steel. He had a good attitude about it all. That helped. But throughout the morning guys (not just from our squad) would walk up to him after he finished a stage and give him advice. They meant well. We all do when we give advice. But this is a problem with shooting and shooters: everybody believes they have some key that will help the other guy. I've fallen into that trap before. Giving categorical advice right on the spot. Something like: "Your problem is. . . " or "What you need to do is go home and . . . " or "Go to the range and do this. . ."
First, before giving advice we should make sure we have the facts straight. True, some guys are able to look at a shooter and give immediate and helpful advice. But most of us mortals are not able to do that. When we try we are usually just blowing hot air. "It's your grip." "You are anticipating recoil." "You need to strengthen your weak hand grip on the gun." And more. If I give advice, I'm going to make sure I've carefully observed someone first before jumping in and giving my pet little tip or hint. Just because I had certain problems when I started doesn't mean everyone does. And quite frankly, I don't know that I'm qualified to help everyone. Second, a new shooter that is barraged with advice from so many people will just be confused. He's getting conflicting recommendations. We should help him if he asks us, but not comment on every mistake we believe he is making. Most significantly, he doesn't know who to trust. If he needs to work with someone to improve his skills, then he should be allowed to choose the person he trusts to work with him. If we know him, then that's different. If he asks us, then by all means give your opinion. There's a ton more to say about this. It wasn't that bad today; not at all. But I've had to resist this temptation myself and so this is mainly a reminder to me. I don't know as much as I sometimes think I do. So true. I rarely offer advice to new shooters - unless it's just something obvious. My wife has run into this - where several different people offer conflicting opinions on the best grip. It has been awhile since I have been to the range. But I do know that my breathing while shooting is a major problem. I do remember to breathe (LOL) but don't do it properly and so...well....you know the rest. George, you should never breath during a match. Wait unit the match is over to breath.